Planning permission was recently received for nine residential flats on a difficult brownfield site at the heart of Chapel Allerton, Leeds. 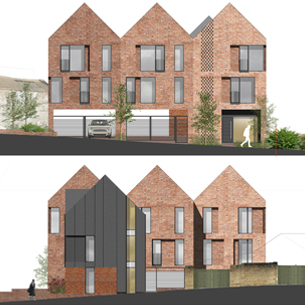 GWP Architecture worked closely with Leeds City Council to obtain permission for this Passivhaus scheme, set within the local conservation area. This project follows the success of our first certified Passivhaus scheme at Carnegie Village, Leeds Beckett (formerly Metropolitan) University – the first student accommodation scheme to achieve Passivhaus accreditation back in 2009. The one and two bedrooms flats for Eco Res Solutions will provide a high level of occupant comfort, while using very little energy for heating and cooling. They will be built with meticulous attention to detail and rigorous design and construction according to principles developed by the Passivhaus Institute in Germany.